PCoIP is short for PC over IP and is a high performance computer display protocol used in endpoint virtualization to deliver rich content. PCoIP from Teradici uses advanced compression to provide end users with cloud-based content. PCoIP securely delivers applications or workspaces from the cloud or datacenter to the endpoint by compressing and encrypting pixels to end-user devices. More than 10 million endpoints use PCoIP. NCS is a close partner with Teradici. 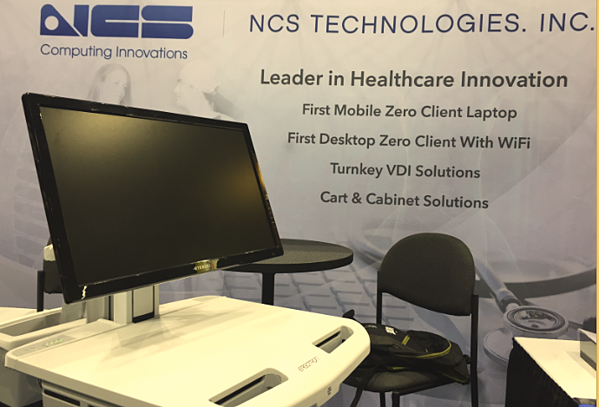 NCS offers a portfolio of six innovative PCoIP-enabled desktops and laptops that are used in healthcare, civilian government, military, retail and industry. The PCoIP protocol transfers only image information in the form of pixels, so no business or personal information ever leaves the cloud or data center. PCoIP technology is designed to deliver a high performance user experience for workers using even the most graphics-intensive applications. With Teradici's licensing, there is a complete set of remote access solutions, enabling lower IT costs and reduced admin time. When using All Access existing applications can easily be migrated whenever needed. All Access allows the IT manager to manage, optimize and future proof any data center and zero client deployment. Datacenter elements and end points are always up to date, managed efficiently and supported by Teradici. Teradici All Access subscribers get exclusive access to cloud access software, PCoIP Management Console Enterprise, firmware upgrades, resources and support. Download this brochure to learn more about NCS virtualization solutions.